Assassin’s Creed Odyssey was due to launch its first live event this week, setting players forth across Ancient Greece in search of limited-time japes. However, thanks to unspecified technical issues, Ubisoft has been forced to admit defeat and cancel the whole thing. 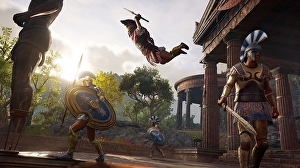 Last week, Ubisoft announced that Odyssey’s live events – an opportunity “to face challenging battles and earn Epic and Legendary rewards” – would alternate between between Epic Mercenary and Epic Ship contracts. Things would get underway, it said, on October 16th. All seemed golden when players logged into Odyssey yesterday, with in-game notifications announcing the arrival Damais the Indifferent as Epic Mercenary target number one. Unfortunately, despite players’ best efforts to find him, Damais was nowhere to be found.